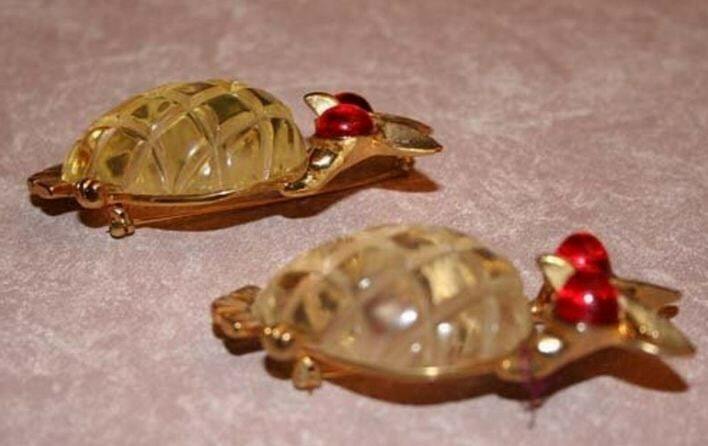 These Coro Owl Carved Lucite Jelly Belly Brooches are very unusual. I have seen the coro duette owls but these are not a duette, they are companion pieces. The eyes are different, see the side view for more detail, the one in the front has very pointed tall cabachons, the back one has a flatter cabachon, and also shows signs of glue underneath, I think these are reglued. One belly has discolored slightly, one has remained clear. In very good vintage condition appropriate for their age. 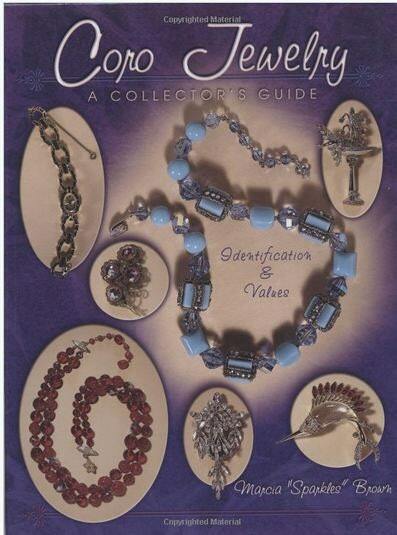 I have consulted with Marcia Brown, the author of Coro Jewelry, A Collector's Guide while I was at the International Vintage Fashion and Costume Jewelry convention in October of 2009. She examined these pieces very carefully and agrees that these are probably not reproductions, that one of them IS older than the other and that perhaps the design was retrieved from the archive, adjusted and re manufactured. 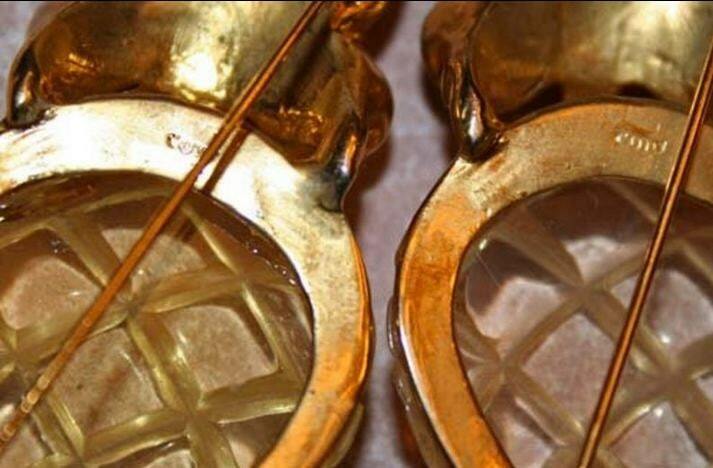 That would account for the slight differences in the finish, the ears, the color of the lucite and the different sized cabochons used in the eyes. 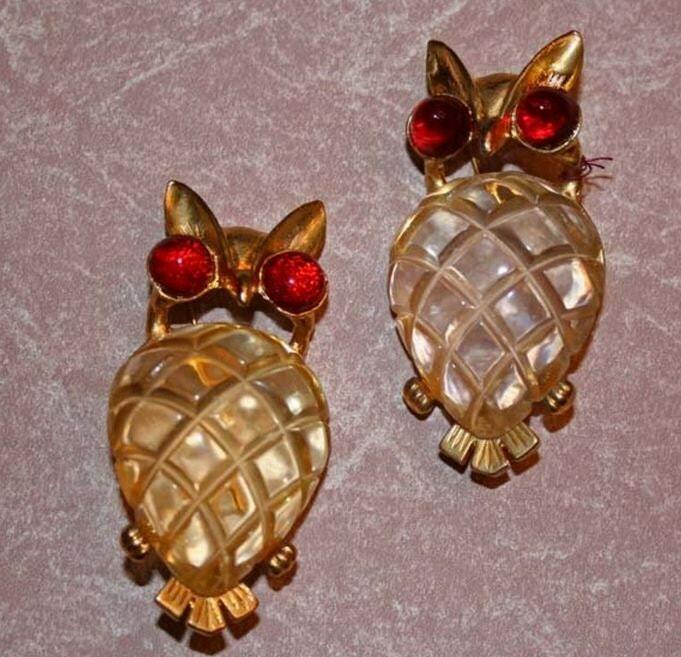 Marcia felt that the owl with the flatter cabochon eyes was the older of the two. Slightly over 2 inches tall, they are a nice pair if you want to make a statement.